If you are interested in the Teacher Training, Yoga Immersion, or any of the below trainings, please come to this meeting. Bring your questions! We will have an informal introduction, overview of the program, and question and answer period. Graduates and current students will be there as well to help answer your questions. 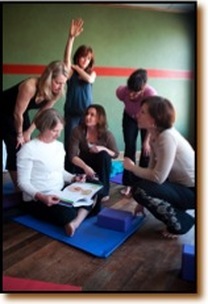 If you have never taken a class at Yoga Loka, please attend the 8:45 am class as our guest. 1 hour private session and 1 hour observed private session. Recordings will be provided if you are unable to attend in person. $450 for this module in addition to above-	If all prerequisite are taken consecutively. Additional $100 discount for graduates of YL. $200 discount for full tuition payment by September 1st. After Feb. 7th, remaining 100 hours will be apprenticeship based. Additional $100 discount for graduates of YL. $200 discount for full tuition payment by September 1st. After Feb. 7th, remaining 100 hours will be apprenticeship based.